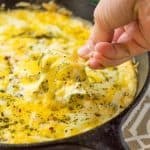 My Poblano Popper Skillet Dip is a new twist on the classic jalapeño popper dip with a smoky kick! Start with roasting your poblano peppers if you haven’t already done this. I roast mine whole on the grill, rotating until all the sides are blistered. Remove the poblanos from the grill and cool slightly. Place your grilled poblanos in a zip-top bag or closeable food storage container until cooled completely. Once cooled, rub the poblano peppers to remove the skins. Discard the skins and the stems. I leave the seeds. To make the poblano popper dip, preheat oven to 350F. Combine the cream cheese, shredded cheeses (reserving 1/2 cup for the top), poblano peppers, and all the spices. Spread in an oven-safe skillet. I use an 8-inch cast iron skillet for this. Top the dip with the remaining 1/2 cup shredded cheese. Bake at 350F for 15 minutes or until bubbly and lightly browned on top. Remove the skillet from the oven and place on a hot pad or trivet. Serve with tortilla chips. I like the scoop ones so you can get more!